1. Work Up On The Buyer's Terms As you know the buyers are the 'stars' for any business, therefore, their preferences shall be the first precedence. Moreover, these stars have to no longer depend upon the sales people to gather the information owing to the support of the innovative technology that is profuse with the unprejudiced information. As a result, 2016 will see the B2B sales reps sharpening up their advertising, cold calling, and other outbound efforts, in order to give the customer what they're actually seeking for. 2. Get A Grasp Of The Virtual Reality Since it's harder to direct the customer's choices with the information they already know, the B2B Sales Representatives require infusing the virtual reality in their marketing strategies. The 3D views allowed by this technology will aid the marketers in inducing the powerful emotions in the minds of the customers by showcasing the behind-the-scene views or future outlook of a particular project, the making of a product, etc. 3. Make A Well-Planned Use Of Content Marketing By Using Analytics While the content marketing is already rampant among the B2B marketers no matter what the size of company or industry is, the next year will see a much more calculated use of such content. For this, the B2B Sales Reps will have to track down the traffic, engagement behaviors, and the content consumption by the customers using the analytics tools and technology. 4. Harness The Power Of News In The Sales Efforts Known as "Newsjacking", this marketing strategy is relatively new for some B2B sales reps. It is the knack of instilling the marketing endeavors into a raging news story to grab the attention of customers and the media, thereby, growing the sales leads. 5. Utilize The Strength Of Video Marketing To Cent Percent Given that the Youtube gets approximately 4 billion video views daily, it is mandatory for the B2B marketers to strap up the power of the videos to their business. The videos to be used should be of high quality that iterates the terms and wants of the existing and prospective customers and partners. 6. Create A Strong Alignment Between The Sales And Marketing Reps Instead of doing it all alone, the sales and marketing representatives need to work together by identifying the needs of the customers through their insights, objections, and intelligence, in order to craft a productive content and generate more conversion of leads. For this purpose, the organizations will self-educate the reps through conducting the webinars, demos, etc. which will help them in better coordination and closing the deal. 7. Get The Latest Software And Sales Automation Tools The lack of modern technology had always thrust back the B2B sales rep far behind in the contest due to the dependence on the human mind and physical efforts to meet the needs of the clients. However, the adoption of innovative technology and tools like the Tellwise, SalesLoft, and Tout will aid the CRMs in rendering better experience to the customers in the approaching years. 8. Embrace The Revenue Responsibility After improving the coordination between the sales and marketing reps, and using the better technology, the organizations are expected to create the better opportunities and customers rather than deriving satisfaction from generating the leads in a target. All of the above are the few resolutions that every individual and b2b organization involved in the B2B sales shall adopt in 2016 to see optimistic results and enhanced customer response in the future. 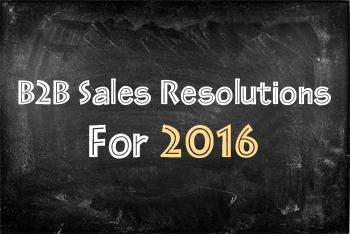 2 thoughts on "B2B Sales Resolutions For 2016"
After study a couple of of the weblog posts in your website now, and I actually like your means of blogging. I bookmarked it to my bookmark website record and can be checking back soon. Wonderful goods from you, man. I have understand your stuff previous to and you are just extremely wonderful. I really like what you have acquired here, certainly like what you are saying and the way in which you say it. You make it entertaining and you still care for to keep it wise. I can not wait to read far more from you. This is actually a tremendous web site.